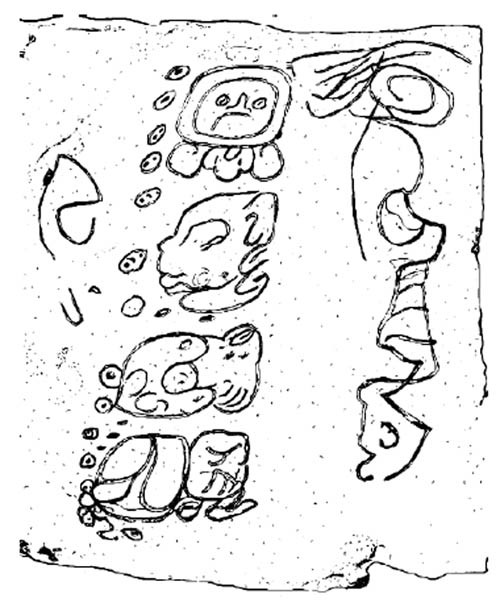 Yesterday the news spread around the 2012 world that there is another ancient Maya inscription that mentions December 21, 2012 on the so called Comalcalco bricks. For example, Rob Bast wrote an entry called Dec 21, 2012: Second Mayan reference. That is wrong for several reasons. The date in question is a Calendar Round (CR) date, not a Long Count (LC) date. It happens to be the same CR as the one that ends on 13 Baktun. However, the CR repeats every 52nd year so it can be a completely different date. So when Bast writes that it refers to December 21, 2012 he is making several assumptions, one of them being the correctness of the GMT correlation. However, let us assume this date is the same as the one mentioned on Monument 6 at Tortuguero, what does that tell us? For 2012ers this seems to imply that a 100% rise (from one to two) in the amount of known inscriptions mentioning 13 Baktun is staggering news. Bast argues that this “begs the question, how many more are there, kept secret?”. It has never been kept secret (this is just one of those tiresome conspiracy theories prevailing among lazy 2012ers and pseudoscientists). I suggest Bast do the hard work of going through all inscriptions. He has to do that work for himself and if he had done it he would have known about the bricks a long time ago. If Bast actually had studied Maya history rather than looking for comets he would have known that Comalcalco was conquered by nearby Tortuguero in 649 (GMT), during the reign of Bahlam Ajaw, the man responsible for the infamous Monument 6 at Tortuguero. So instead of two separate inscriptions referring to a future prophecy we may have two inscirptions related to one ruler who emphasized the 13 Baktun date more than any other known ruler. If the bricks are from his reign or later they may actually be related to this king rather than a future doomsday. Update (December 13, 2011). Stanley Guenter elaborates on the “Comalcalco brick gate” on his blog. Obviously I have read a lot of books on 2012, but no, I haven’t delved into the depths of epigraphic research. So, it was news to me, and news to most 2012ers. That it had been “subject to thorough study” suggests that they thought it could be connected to the end of the Long Count. Not in public view suggests being kept secret. Critical thinking is an important component of intelligence. Do you believe everything you read? Robert, I’m afraid you aren’t showing yourself to be much of a scholar. You attempt to present yourself as a “2012 Researcher”, but the 2012 date is based entirely upon Maya epigraphy and yet you admit that you haven’t investigated epigraphy much at all. (Something that is appallingly obvious.) That is the equivalent of someone saying that they are an expert on the ancient Sumerians but haven’t paid much attention to cuneiform studies and have just relied on the work of Sitchin. a)The month name is not Kankin, as it would need to be in order for this to be a reference to the 2012 date. The month is Xul, as demonstrated by the infixed AK’AB “darkness” sign on the back of the cheek. b) Even if this were Kankin (which it is not), since a Calendar Round repeats every 52 years, there is no reason to connect this to 2012. All we would have is the equivalent of “December 21”, hardly enough to show a connection to 2012.
c) The verb is hu-li, “arrived”, which is not given verbal affixation to make this a future reference. Therefore, the event referred to is historical, ie// a reference to an event that occurred in the Late Classic period. d) The grammar of Mayan languages indicate that the final glyph cannot be another verb, but rather is a name, either of the person arriving or the place that was arrived at. The final glyph cannot read tzutzjoom “it will have ended” as Erik Boot has suggested. In summary, this Comalcalco brick has NO reference to 2012 and therefore there is NO conspiracy to keep this silent. Erik Boot is a good epigrapher but he is wrong in his analysis of this piece. Robert, if you want to be taken seriously as a “2012 Researcher” you need to do some real research. Simply repeating claims you demonstrably do not understand does not qualify you as a researcher. If you insist on calling yourself one, then actually spend some time learning something about Maya epigraphy and the Maya calendar before you go producing websites and books devoted to the topic. …maybe Hunbatz Men has found a couple of tourist souvernirs with the inscriptions and he will claim they are authentic? To be complete, here is Erik Boot’s response to the aztlan discussion last year: http://old.nabble.com/FORWARD-FROM-ERIK-BOOT-TO-AZTLAN-td29252221.html In this he outlines the sequence of ideas and emails and publications that have led to this new 2012 fiasco. (see the bottom of page 8 and top of page 9 for the discussion of the Comalcalco brick). The Wayeb Notes are one of the most popular venues for epigraphic publications, and all 2012ers worth their salt know of Gronemeyer and MacLeod’s publication. So much for Robert’s idea that epigraphers were keeping this “secret”. It only took a few sentences for the ‘writer’ of this article to reveal he is mired within lower vibrational thought processes. Labeling those with opposing viewpoints ‘2012ers’ and ‘conspiracy theorists’ clearly illustrates the author of this poorly written propaganda piece is not an open minded researcher, but merely another sheep following right along with the commands of his herder. The long and dirty history of the prevention of many archeological discoveries from reaching the mainstream media is well known by many respected members of the archeological community, of which the writer of this uninformed opinion piece, Johan Normark, is not even remotely connected. Not at all surprising is that Johan intentionally avoided the tiny matter of the ‘Comalcalco Brick’ having been covered by Stucco to conceal its message, or the fact that the brick was turned inward towards the wall at another time. I’m sure Johan Normark, after careful investigative research, has concluded the Maya themselves felt it necessary to hide their own artwork. I will certainly visit this webpage in the future whenever I am in search of expert opinion such as Johan Normark offers. I also see Johan is an expert in the climate field, and wait with baited breathe his uninformed and opinionated musings on this subject as well. Using an argumentum ad hominem doesn’t add anything to civil discourse. Your personal attack on Johan Normark who you say is a ‘writer’ makes you look silly, then you argue against a straw man by saying he refers to those with whom he disagrees as ‘2012ers’ and ‘conspiracy theorists’. I don’t see that in his post. Then you advocate paranoid conspiracy theories. I suspect that what really rankles you is his joke about Hunbatz Men who is laughing all the way to the bank – maybe with your money. I guess you haven’t heard that the crystal skulls are modern hoaxes. Seems like people of all levels of education have made a comment on this blog post. Thanks Stan and Tlalocantecutli for adding more information on the topic. Check out “David Stuart” 50 s into this clip… This is not him, this is John Major Jenkins (LOLZ). Johan, excellent work as always. Yes, I love 2012ers and conspiracy theorists like Greg G. They have an urge to let us know their opinion even if they have no clue what they are talking about. These claims about the Comalcalco brick have also caused a resurgence in the claim that there are bricks at Comalcalco that appear to be Roman in origin. I was wondering what the archaeology community’s actual view on this was, as a brief search only brings up less than reputable sites. I have asked around on facebook if anyone knows about proposed connections between ancient Rome and the Maya. What I can tell you right now is that the “peak” of Comalcalco coincides with early Medieval Rome. The so-called “arches” on some of the causeways in the Puuc area are even later and show no direct resemblance with Rome. If there had been any contact between the Early Classic Maya and late imperial Rome we would have seen much more architectural similarities, beliefs, writing, etc. The bricks of Comalcalco look nothing like the bricks of Rome. The Comalcalco bricks are thinner and wider than Roman bricks, as I recall. The etchings on Comalcalco bricks are crude, but clearly Maya in style, and contain absolutely no elements from Roman or European iconography. There is absolutely nothing about Comalcalco that would make one think of Rome, other than the word “brick” itself. There is as much reason to invoke Mohenjo Daro or Babylon as there is Rome if you want to make Old World comparisons, but there is no connection at all. The architecture at the site of Comalcalco is standard Maya in style, and the only difference is that the buildings are made of brick. to be able to read this very Comalcalco brick in question as a bilingual Olmec-Maya text. Winters is a notorious Afrocentrist who thinks the Olmec were Africans and his translation of this Comalcalco brick’s “Olmec” writing is compared to Malinke (Mandinka) language. Check out the link for his “translation” of this brick. Winters is an obvious fraud and mountebank who doesn’t have a clue. The idea that there are Roman or African connections here is ridiculous and completely contradicted by the facts. Sadly, that will in no way restrict its popularity. Thank you. This is the exact kind of answer I was looking for. I already knew most of the claims the media was making regarding the Comalcalco bricks were factually incorrect, but I was looking for a response from a legitimate researcher as to why this specific claim was incorrect. John Hoopes also notes that it is entirely possible that the ballast in Spanish and other European ships “could very well have contained Roman pottery, bricks, metal artifacts, and even coins, a fact that has been cited as a possible explanation for fragments of amphorae and such that have been reported–in mostly anecdotal accounts–from the coastal waters of the Americas”. Comalcalco would not have been affected by this practice though. Yes, she wrote that in 1957. Indeed 13 baktun would have been very important since 13 is a significant number in Maya numerology. However, it does not mean there is an end to the Long Count on that date. Thanks alot mr. normark i got 1 last question and is regarding the maya eschaton which concerns a form of prophecy of the end of the world and the maya eschaton which states 21/12/12 by the roman calendar will be the day when the mayans and the gods recreate the world for the 7th and final time what does this mean? I have no idea since that is not an idea coming from the Maya but from some, to me, unknown source. The idea is taken from popoh vul which extates that the gods created three failed worlds followed by a sucessful fourth world in which humanity was placed in the mayan long count the previous world ended after 13 baktuns or roughly 5,125 years the long counts zero date was set at a point in the past making the end of the third world and the beginning of the current one which corresponds to august 11 3114 in the proleptic gregorian calendar which means that the fourth world would have reached the end of it’s 13 baktuns or mayan date 13.0.0.0.0 on december 21st 2012 that is what in meant in the eschatology documentary i saw what does this all means mr.normark? You mentioned seven creations in your earlier comment and now you refer to Popol Vuh and its four creations. What are the other three? In any case, the highland myth Popol Vuh was written down over 600 years after the Long Count had ceased to be used in the lowlands. There are temporal and spatial differences and Popol Vuh is by many no longer seen as the good source for the Classic period cosmology that Mayanists believed a decade or two ago. We find NO evidence of multiple creations in the Long Count. There are a couple of “pre-era” dates but they do not mention three or four creations. What i do not understand is why near the end of the article the archeologers say they are writting off the mural can anyone explain why would the say that about such an important find? Carlos: There were three previous creations in the Popul Vuh but there were four in post-classic mythology. These are the four rectangular glyphs surrounding the center of the Aztec calendar stone. I can’t believe that an “archaeologist” came to your school and spilled such a complete pile of balderdash. Johan: there are lots of pre-creation Long Counts in the form of distance inscriptions on monuments and Long Reckonings in the Dresden Codex. The study of these allowed Thompson to realize that the creation date was actually a huge number of 13s.13.0.0.0.0. ‘lots of pre-creation Long Counts’. Do you mean pre-creation long count dates? Not sure I understand your question or what part of the text you have misunderstood. Simple answer: the find was recently made and Xultun was not a well known site before this. No one has “written off” the site after this discovery, that is simply a poorly phrased sentence in National Geographic. Actually , it is not a poorly phrased sentece, it is instead one ‘poorly read’ by Carlos. It says that archaeologists ‘had written off the site’ because it had been heavily looted in the 70’s, meaning they had given up on it. “According to the Popol Vuh, a book compiling details of creation accounts known to the K’iche’ Maya of the Colonial-era highlands, we are living in the fourth world. The Popol Vuh describes the first three creations that the gods failed in making and the creation of the successful fourth world where men were placed. In the Maya Long Count, the previous creation ended at the start of a 14th b’ak’tun. 1- How is the above wikipedia statement correct, or wrong? 2 – Also, are there any dates, or references to dates AT ALL within the Popol Vuh? It is correct seen separately but not put together. The author of the article projects Popol Vuh into the Classic period Long Count. The Kiche did not use the Long Count and we now know that Popol Vuh is not an exact copy of earlier mythologies. There are many things in Classic period iconography that cannot be explained by Popol Vuh. Hence, there is no need to be perplexed. The Maya changed through centuries but the author of the article treates them as the same by projecting something later into an earlier part of Maya history where there is not foundation for that claim as far as we can tell today. The Popol Vuh does not say anything about an end to the current creation: it sets up a progression of eras in which the gods’ creations move from being total disappointments (the first) to being perfect (the current one). The idea that our current world was in danger of ending comes from Aztec mythology; the K’ichee’ were strongly influenced by central Mexican culture but there is no evidence they adopted that particular myth. In regards to your second question: No. In fact, the Popol Vuh is very flexible in its treatment of chronology. The narrative skips back and forth in time, and does not include any sort of “break” between the supernatural past and mundane present. The text is very readable, there’s a great introduction, and the footnotes are interesting.